I have been assimilating my experience of the Crabwood / Pitt / Sparsholt Face and reading others' thoughts about this crop formation. I want to bandy some notions around to see if it's possible to proportion and clarify a few of the issues. I take an unashamedly intuitive and metaphysical approach to this. I have no doubt in the validity of my experience in the Face formation (on Saturday 17th August). To me, it was fundamental and deeply stirring. Something in me simply knows the formation is genuine. If, as it has been suggested by some, it was made by humans using secret advanced technologies, I would have felt something strange about it. This formation had a distinctly benign, friendly and clear feeling to it. Lots of signal, little noise - even from the radio transmitters nearby. For me, therefore, all my thinking gravitates around this starting base-line: the formation is genuine. There are indeed weird aspects to it, but these throw us, not it into doubt. The formation is unequivocal and literal in its visual presentation, and I perceived it to have a very personal feeling to its energy-presentation. The 'main series' of formations over the years (generally accepted, high-quality ones we all know and love) have had an enigmatic quality which leaves us hanging: we never get answers in our own lingo and never find out who, exactly, is behind them. But the Face gives readable information, with an individual, specific flavour and source. Last year's Chilbolton Face and Message and this year's Face have connected characteristics, such as close-by locations, a similar oblong and rasterised format, and a face presentation, but they also have critical differences, such as the method of rasterising and the difference in the faces. [Rasterisation is the way black-and-white photos are rendered into subtle shades, usually using dots.] My sense is that these formations were done by different, collaborating, sources, each with a style of its own. Some people have judged this year's linear rasterising effect to be in some way inferior to last year's dot-rasterisation. This is a hasty conclusion - we don't know the full story yet. Some people react against ET stuff. In the croppie movement there was once some enthusiasm for ET connections with crop formations, but nowadays this has subsided. This might be correct, in that the originators of most formations seem, by consensus, not to be physical or semi-physical ETs - they seem to be multi-dimensional intelligences, and not of this Earth. I don't believe the occasional 'balls of light' seen around some formations are necessarily ET-related - they can equally be consciousness- or dimensionally-related. For me, the energy-imprint within most genuine crop formations is distinctly 'cosmic' in flavour (rather than 'ancient', 'natural', 'human' or 'ET'). Yet here, in the Face, we are faced with an ET, and each of us is therefore getting our ET buttons pressed. Strong reactions to this formation are to be expected. Someone has suggested, "Why don't ETs just land in front of the White House, instead of bothering with crop formations?". Answer: ETs have shown themselves already, in the widest range of locations, for decades. Close encounters haven't changed much, affecting only a small minority of people. Second answer: crop formations are a new way of conducting 'interworld' communication. They possess many advantages over mass close-encounter events. Formations can be measured, photographed, meditated and picnicked in, returned to and discussed at length - no one disputes they actually happen. They appear next to motorways. Meanwhile, for ET contactees, it is difficult believing fully in the experience one has had, let alone integrating it, remembering it, or sharing the experience with others. The worst bit is that no one believes you. As an object-oriented communication medium, the close encounter has diminished in effectiveness. Crop formations are a logical next step. Now, following from these, we have the Faces. The ante has been upped: now crop formations (or at least, the Faces) are becoming inextricably linked with ETs. I've found that distinguishing rigidly between physical humans, ETs and non-physical 'intelligences' is inaccurate - they exist as 'types', but there are many variations and cross-overs. Ten years ago I talked at length with some 'deep space' intelligences, the Council of Nine, while compiling a book for them called The Only Planet of Choice. The Nine told how they worked with a collaborating network of civilisations and helper civilisations with a wide variety of characteristics. This loosened my perception, and now I see it as entirely feasible for 'intelligences' and ETs to be involved with each other. In the transition from 'classic' crop circles to the two Face formations we see a shift of provenance from 'intelligences' to specific ETs. They might well be working for the same basic cause. But these ETs seem to derive from specific species and worlds. This would presumably imply that 'the management' has decided that human contact with ETs might be easier and more convincing than with formless metaphysical beingnesses. Whether or not this is true is being tested as we speak. You yourself are part of the survey sample population. Someone commented that "The Face looks like it's out of Startrek", as if this somehow cheapens it. Gene Roddenberry, creator of Startrek, communicated with the Nine in the 1970s, obtaining much detailed information. The notion of the 'prime directive', now well-known, came from them (though they are not unique in having this idea). Other films, such as 'Close Encounters', have clearly drawn on insider ET information. Thus it isn't extraordinary if there is a resemblance between our friend The Face and certain Hollywood ET movie characters. All this said, I'd suggest it's not helpful to compare The Face with Startrek portrayals. The Face must be taken for itself. It is introducing itself to us. Let's take it as it presents itself. This is important. The creator of the Face is testing us and watching, to see what happens. Milk Hill in 2001 represented a climax of the 'main series' formations we've seen through the years, and not a few of us figured that it might be something of an 'end statement'. The question immediately arose, "What follows?". We didn't have to wait long for an answer. This is what follows. We're into a new level of the game. I've been thinking of Terence Meaden, and the way cereological events - the complex formations - simply overtook him and his meteorological Plasma Vortex Theory in the early 1990s. We might be facing another of these. The makers of the formations are testing the elasticity of our psyches, giving us another kick. It's an unfolding process: there is more to go. The answers aren't simple. The binary code shown in the disk will, I suggest, turn out to have further layers of meaning than what has so far been decoded - it could contain musical notation, various mathematical subtleties or be somehow multilingual. Even the Face section of the formation could be coded. To me, there's a problem in cereology, arising from the attention given mainly to the corn and its lay. The empty space created within a formation is generally deemed unimportant. Naturally, there's a difficulty identifying and articulating characteristics to this 'empty space'. I've been suggesting for years that it might be far more important than we think. The way I see it, these guys are specifically addressing complex, educated, developed-world types living in a very materialist culture. This is tricky. So they have laid down elegant, intellectually satisfying, continually-evolving formations in order to draw us into these created empty spaces. Formations contain energy fields which have given people time-warps, paranormal experiences, healings, sound phenomena, headaches, eye-openings and serious cases of unstoppable, obsessive fascination. They have an effect. This is a seriously under-researched element of the phenomenon. 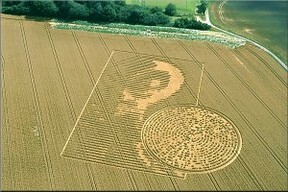 It might be that the energy field is more important than the imprint in the corn. A crop formation is a way of getting us to enter their world, without need for space-craft, spiritual adepthood, abduction or intercessors. Very ingenious. These guys are scattering information-capsules all over us, for present and future use, and dosing us up with magic radiations. We're in a healing crisis. Photographs, patterns, the lay of the corn and design sophistication do the communication. But visits to the formations and opening up to them creates communion - an imbibing of those energy-fields. Much of this communion is semi-conscious - something happens, but we don't know precisely what. The more you give it attention, the more distinguishable and comprehensible it gets. Communication and communion are reciprocal processes - we are in a mutual logging-on process. Someone has already pointed out the parallels between the code in the disk of The Face and what in computer-speak are called 'handshaking protocols' - by which two separate computers establish terms of contact with each other. This 'handshaking', between us and a specific off-earth species, is both enticing and daunting. A diplomatic feeler has been sent to 'we, the people', to see how we will respond. The sociology of the response is probably as important a phenomenon as the formation itself. I felt a person-to-person contact with that being, experiencing a 'download' lasting about 40 minutes. I permitted it and focused on receiving it. This kind of stuff rattles rationalists yet, for me, it was a surprisingly objective experience. It resembled meeting a person on the other side of a screen, a very different person with a different language and mind-set, and a charismatic, high-energy presence. I don't know what we communicated, but a detailed exchange happened. Afterwards, a classic symptom of a genuine profound experience came up - a feeling of privilege, humility and blessing. I had initial anticipations about visiting that formation. Then, on arrival, I was neutral, easygoing. On entering the circle I rapidly fell into a sense of shock at the intensity that hit me. It challenged me to rise to it. Then, on settling down, there followed a series of profound inner experiences. I was in the formation with some 15-20 people. Many of them lay silently on their backs, 'out like a light', in the centre of the disk, for 1-2 hours. They would have been much more restless and talkative had the strong energy-field not been there. I submit these observations as evidence of the genuineness of this formation, however unscientific, subjective or personal such evidence might be deemed. We ask so many questions. Yet it is we who are being questioned: do you choose to follow this process, or not? Choosing involves acts of trust. Trust means a suspension, not an abandonment, of rationality - rationality reconstitutes afterwards. Cereology engages a fine array of different people, and my 'mysto' viewpoint represents but one shade in a wide spectrum. Yet this testimony is valid. The strength and palpability of the energy-field in this formation, to me, decides the matter of its genuineness. The intensity and variety of people's reactions to seeing aerial photos of the Face is surely one more indicator of the formation's genuineness - there's energy there. This story will keep on running. The speed of its progress depends a lot on our response. How to respond? For those closely involved with the phenomenon, it's a matter of saying Yes to what we have witnessed - they'll pick it up. To the wider world, it involves seeing our world affairs in a new, expanded light - something to do with appreciating how small we are, and how much we flail around in the complexity of our earthly affairs. If we are to establish relations with off-Earth beings, we'd better soon achieve a global consensus. Our nations become mere counties of a planet. Over the years, the crop formations have given us a wake-up call. But 'the management' is now evidently raising the stakes. Our trip-switches are getting hot. Something is going on.